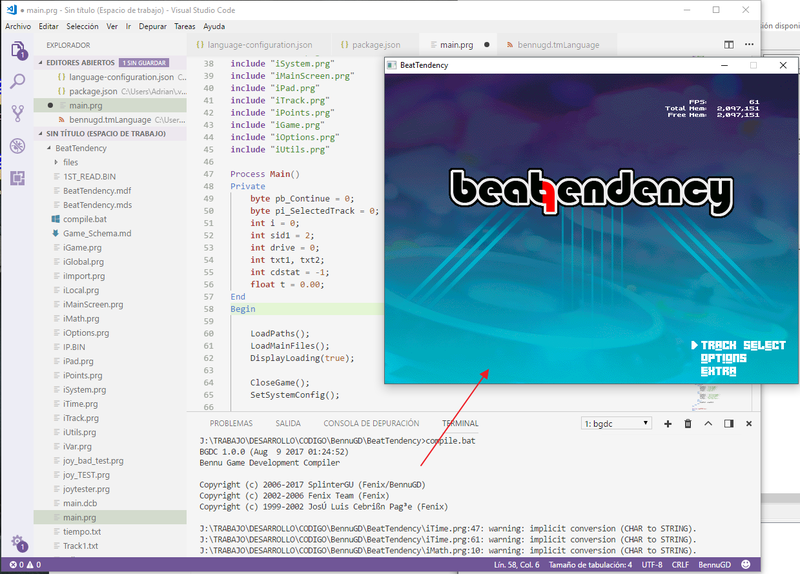 This last week I'm working on "the possibility of use Visual Studio Code for write BennuGD code and compile games on it". I got it finally and I wrote a extension for this IDE for has the syntax highlighting support for BennuGD on this. If someone wants to use it because they think it might be useful, here are the links to my github repository. To Improve: block comments, I dont't know how to configure it yet, maybe in the next update. Yeah!!!! I was thinking on that this week! I think that Visual Studio Code is a powerful tool and maybe well be great for Bennu. Nice! I didn't know of the existence of this IDE, I will create a news on the home page linking to your repo. One Question. How do I compile and run the program from the IDE? Hi JaViS , thanks for your comment. Well it's easy, I'm explain you. How execute this on Visual Studio Code? 4. This terminal must has your game folder as currect folder. 5. Now, you can write compile.bat here in the terminal, press enter and the code it's executed and any error o something response of the compiler writes here. Very detailed explanation!! thank you for taking the time to explain it. But, isn`t there a way to integrate the compilation onto the interface? Well, yes it's possible, I'm explain you. Once the language exists on vscode, you can create your custom debugs like press F5 an run the code. Why use vscode instead of notepad++? For me, the reasons are various. My lack, and the reason to look for another editor, is the posiblity of autocompletion , not for the sintax, but for the user variables, user functions, etc..
Can you explain how to you did it? I never can see the functions/process definitions and never seen a console embeded on the botton- Can you explain it please? The console is another plugin called NpExec. It's allow to have a console window to send commands and read output info. It have the possiblity to store scripts to run batch and you can assign a color to error line and doble click in the error goes to the source code line!! It would be great if your README file explained how to install this extension (or if it is a standard VS code procedure, to link the documentation).I'd like to try this as VS Code is a very interesting IDE.